It isn't every day you come across these babies, not even here in Maine. Virtually all sea urchins that are harvested in these waters get processed on their way to the sushi bar. Which is fine, because I do love me some uni. But I also enjoy wrestling with nature's creatures from time to time, and so there was no way I was going to pass up a chance to mess with these. Four of them, actually. In case you're interested, this is what a Maine sea urchin looks like from what I suppose you might call "the business end." The small circular area in the center is its mouth, actually. I'm not smart enough to figure out a way to cut open and photograph a sea urchin at the same time, and so you'll have to settle for this after shot. Big surprise, I decided to go with a pasta dish. (I know, who'da thunk?) That's a big hunk of butter, some olive oil, a shallot and a garlic clove. 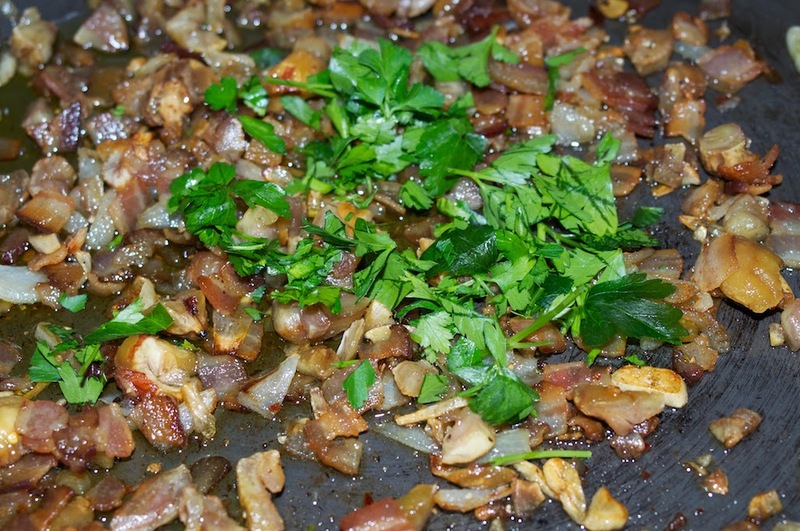 Once the shallots and garlic softened, I turned off the heat, waited a couple minutes, and then added the urchin (a little lemon zest and/or fresh parsley are recommended at this point too). The idea here is to not cook the urchin, but rather let the pasta warm it. And so once the spaghetti was cooked I added it and some of the pasta water to the pan and very gently mixed things together. Definitely one of the richest things I've eaten in quite a while. Which is saying something because, well, you see how I eat. Delicious, though; silky and smooth in a way that few things are. For reasons best left unspoken, I found myself staring into the fridge Sunday evening around seven having no plan whatsoever. As will happen when a half-pound of thick-slice, locally cured bacon is in reach an idea took shape—aided of course by the vacuum-packed chestnuts I had been eyeing earlier. And you thought that I spent a lot of time planning the stuff I share with you here. Dice and saute the bacon by itself for a while, then add a small onion or shallot, three or so garlic cloves and (if you like, which I do) a little hot pepper. When the bacon is cooked and everything else is softened add at least 1/2 cup of chopped chestnuts, more if you like, and stir. Then add your cooked pasta (a half-pound here, and boiled about a minute less than to doneness), grate some Parmigiano-Reggiano or Pecorino over it, and add maybe a ladle full of the (well-salted) pasta water to moisten. Turn the heat up to high and incorporate, allow some of the pasta water to be absorbed and evaporate, then turn off the heat and quickly serve. Next time I make this stuff it'll be on purpose, I swear.